. . . and what is the most surprising thing of all, they [Roman slaves] draw out the water of the streams they encounter [in Spanish mines] by means of what is called by men the Egyptian screw, which was invented by Archimedes of Syracuse at the time of his visit to Egypt; and by the use of such screws they carry the water in successive lifts as far as the entrance, drying up in this way the spot where they are digging and making it well suited to the furtherance of their operations. Since this machine is an exceptionally ingenious device, an enormous amount of water is thrown out, to one's astonishment, by means of a trifling amount of labour, and all the water from such rivers is brought up easily and from the depths and poured out on the surface. And a man may well marvel at the inventiveness of the craftsman [Archimedes], in connection not only with this invention but with many other greater ones as well, the fame of which has encompassed the entire inhabited world . . .
from the 1522 edition of Virtruvius's De Architectura, by Fra Gioconda. 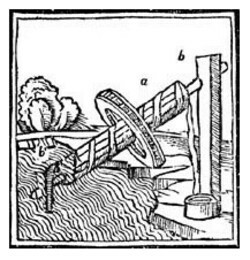 Archimedes screws are still used today, in their original form in the Middle East to lift water out of canals, and in modern water lifting stations in which the screws can be in banks of multiple screws, each one 12 feet in diameter, or they can be the size of a pencil eraser in a machine that pumps blood during heart surgery. Besides lifting water, screws based on the Archimedes screw are used to move solids such as food, animal feed, in harvesting combines, and to move and lift grains.